You are spectacular. Stunning. Special. Your foundation would have to be pretty stupendous to live up to all that. Thank goodness for ybf! Boasting air-whipped technology, this full-coverage souffle foundation goes on silky smooth for a flawless-looking complexion. Swipe on a little primer before you apply it, and you're well on your way to looking truly stupendous. Ingredients: Cyclopentasiloxane, Polysilicone-11, Vinyl Dimethicone, Caprylic/Capric/Succinic Triglyceride, Silica, Stearoxymethicone/Dimethicone Copolymer, Caprylyl Glycol, Dimethicone,Hexylene Glycol, Laureth-12, Mica, Retinyl Palmitate, Tetrahexyldecyl Ascorbate, Tocopherol,Tocopheryl Acetate, Trifluoromethyl C1-4 Alkyl Dimethicone, Phenoxyethanol, Barium Sulfate (CI 77120), Iron Oxide (CI 77491), Titanium Dioxide (CI 77891). Ingredients: Water, Propylene Glycol, Phenyl Trimethicone, Ethylhexyl Methoxycinnamate, Cyclopentasiloxane, Polymethyl Methacrylate, Arachidyl Alcohol, Polysorbate 20, Behenyl Alcohol, Dimethicone, Phenoxyethanol, Arachidyl Glucoside, Sodium Polyacrylate Starch, Hydroxyethylcellulose, Parfum, Tocopheryl Acetate, Sodium Dehydroacetate, Beta Glucan, Caprylic/Capric Triglyceride, Titanium Dioxide (C.I. 77891), Iron Oxide ( C.I. 77492, C.I. 77491, C.I. 77499). Wished it had choice for fair skin. 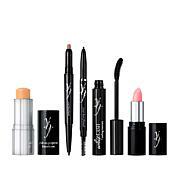 Love YBF, the line is so nice and I use very light makeup and this is just what I needed. The foundation is whippy and so easy to apply with the sponge included (other cos sell a similar one for $25.00) I wet the sponge and wring out excess water then apply small amount of foundation and use small blotting motion to apply. YBF includes a booklet with detailed instructions on how to use their makeup for the best results. Great Company, great Product! By far the best foundation i have ever used.I bought a second set a few days ago just in case its sold out i have a back up.It glides on very smooth and leaves my face silky soft for hours.